I know! I know! Marco’s Pizza makes delicious pizzas. But they still want to know what they can do better! 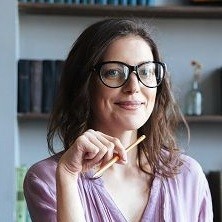 Head online to – www.tellmarcos.com – take the survey and voice your opinion! Marco’s Pizza is getting down and dirty into all the experiences their customers are having at their pizza stores! And it sounds like you have what they’re after 🙂 So go on – take the survey, give them your feedback, and grab yourself some awesome offers to redeem the next time you bite into their delicious pizzas! Hey! I’ve got some good news for you – there aren’t any rules in the TellMarcos survey! 😀 😀 All you have to have is a valid receipt with the survey code printed on the bottom of it. Got it? Awesome! You can take the survey and redeem some wicked offers the next time you head in. 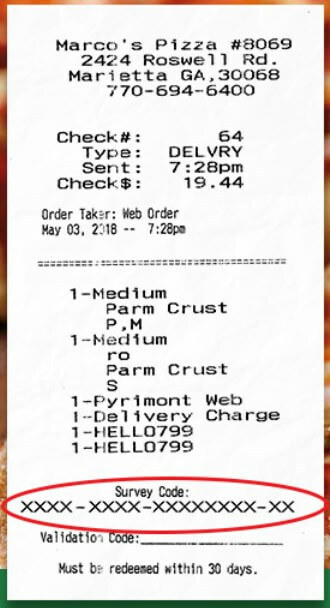 There’s only one thing you need for this survey – the code printed at the bottom of your receipt. If you don’t have one – sorry! 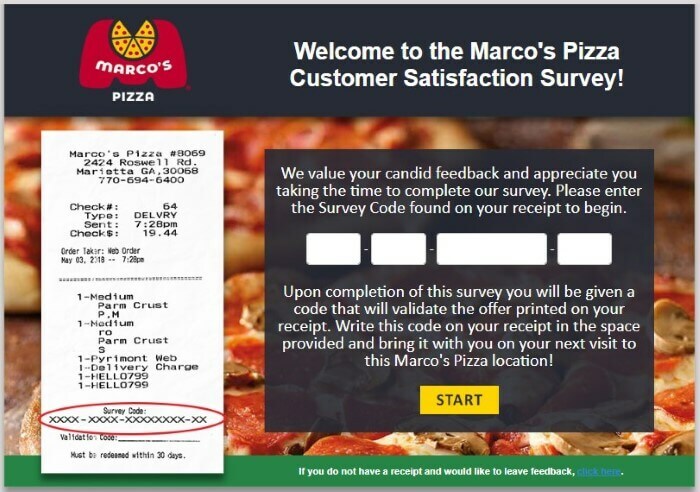 But it looks like Marco’s Pizza isn’t after your feedback for the moment. You’ll just have to buy another pizza and see if you get one then. 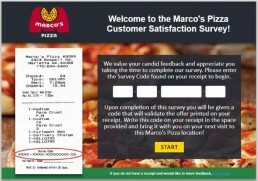 How do you rate your overall satisfaction of the Marco’s Pizza location you visited? How likely is it that you’ll recommend them to friends or family? Was the store clean? Were the staff friendly and attentive? How was the quality of the pizza you bought? Were the temperature and toppings OK? I love an ‘American Dream’ type story, and the story of Marco’s Pizza is just that. Founded in Toledo, Ohio, by Italian immigrant Pat Giammarco in 1978, it now has a whopping 800 franchises across 34 states. Well you don’t get named in the top 10 pizza companies in the US for doing things by half that’s for sure… They’ve even made it as far out as India! 2018 saw this super popular restaurant turn 40 and, as part of the celebrations, the mayor of Toledo awarded Pat Giammarco with a key to the city to commemorate his contributions to the town and his efforts in business. When Pat was just 9 years old, he immigrated to the US. He grew up working in his family’s pizza shop which was based in Dearborn, Michigan, and himself and his dad spent many years perfecting their pizza sauce recipe that’s still used today. 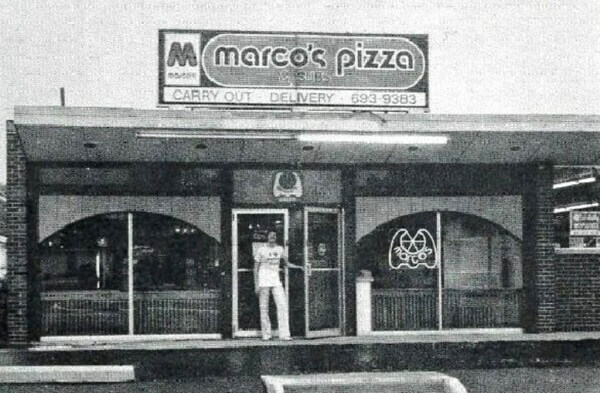 Then in 1978, Pat opened his first Marco’s. In 2004 a guy by the name of Jack Butorac (the company’s current owner) took over and that’s when the restaurant began opening its doors everywhere. Marco’s has since become a household name across the continental US and is unique because of its authentic Italian roots. One of the things they pride themselves on is making their fresh pizza dough daily. They never freeze anything which means maximum flavor is ensured…We all know that a freezer has the ability to turn even the tastiest of dishes into a piece of cardboard! Because it’s a franchised chain, owners have free reign to get a little creative with their pizza inventions and there have been some weird and wacky flavors launched over the years. However, there are usually some staple pieces including the Chicken Fresco, All Meat and the Garden (veggie). The Fresco range of pizzas use a homemade Giardiniera (Italian pepper relish) unique to Marco’s. They also have a range of wings and subs for delivery and takeout, some locations have dine in service too. Employees seem pretty happy with their jobs there. As with any hospitality role, there’s sometimes an issue with the whole work/life balance thing. But, in general, people seem to think it’s a friendly gig with good management and a steady workload. They have a pretty average Glassdoor rating, but the more recent reviews are super positive. Forbes even featured the chain in their list of America’s Best Employers for 2017! They were ranked 251, which might make you think ouch, but they were actually the only pizza company listed on there. They also topped out against all other pizza companies in Entrepreneur’s list of top 500 franchises the same year. Clearly, they’re doing something right! Customer’s feedback is mostly quite good too. In 2014, Marco’s was ranked in the top three pizza joints in a consumer reports survey. They’ve won several awards over the years which they proudly promote on their website and a quick google search will show you that many of their chains have a 4-star rating on Yelp. So, what’s next for Marco’s? Well, 2019 is looking bigger and better than ever! They’ve already stated they want to have a total of 1,000 stores open within the first three months of the new year, that’s gonna be heck of a lotta dough, I can’t wait to see what they do! Dear @MarcosPizza, your Franklin, TN location (the one in Fieldstone) does an amazing job. Great service, great people, great experience all around! Thanks for opening a location near us! If you’d like to get in touch with one of their restaurants near you, click here to use their store locator.